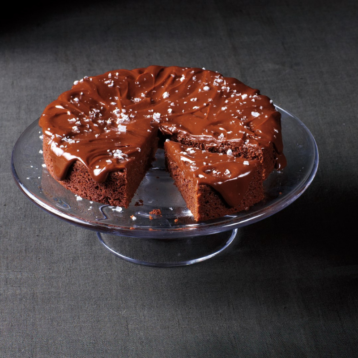 After discovering there is a National Chocolate Cake Day we decided we had to share this heavenly Double-Chocolate Olive Oil Cake with Chocolate Salted Caramel Icing. A recent study also found that dark chocolate enriched with extra virgin olive oil was linked to reduced risk of cardiovascular disease! All the more reason to add olive oil to your baking! Position a rack in the center of the oven and heat the oven to 180°C. Lightly coat a 9-inch round cake pan with olive oil and line the bottom with parchment. Lightly coat the parchment with olive oil. In a large mixing bowl, combine the flour, sugar, cocoa powder, baking powder, baking soda, and 1/4 tsp salt. Stir in the single cream, 125ml of olive oil, and the vanilla. With an electric mixer, beat in the egg until well blended. Scrape the batter into the prepared cake pan and sprinkle the top with 60g of the dark chocolate chips. Bake the cake for 25 to 30 minutes, or until a toothpick inserted into the center comes out clean. Place the cake on a cooling rack for 10 minutes, then turn the cake out onto the rack and let cool completely. Meanwhile, in a medium saucepan, heat the dulce de leche over medium heat, stirring occasionally, until it has softened. Add 2 tbsp of the olive oil and the rest of the chocolate chips and stir until the chocolate has melted and the mixture is smooth. Remove the pan from the heat. Transfer the cake to a serving plate. Pour the icing over the cooled cake, sprinkle with the flaky salt, if desired, and serve. Dulce de leche can be found near the condensed milk in most large supermarkets.